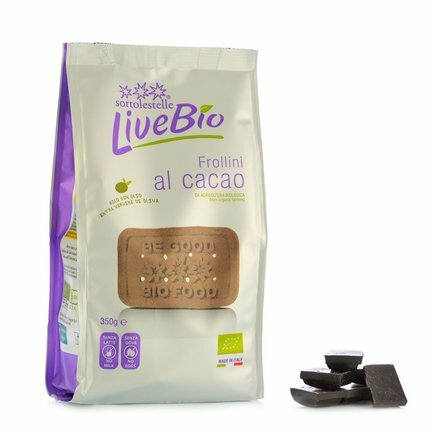 LiveBio cocoa shortbread biscuits are made in the Sottolestelle firm's organic bakery, starting from a super-simple mix without the use of egg, milk or derivatives. In this case butter has been replaced with extra virgin olive oil. These shortbread biscuits are exceptionally tasty and wholesome, perfect for a light breakfast or a delicious and healthy mid-morning snack. The characteristic ingredients in the recipe also include brown sugar and rice syrup. Ingredients Wheat flour 54%, extra virgin olive oil 14%, cane sugar, cocoa 7%, corn starch, rice syrup, raising agents: ammonium carbonate, bicarbonate of soda, vanilla powder. ALLERGENS: Gluten, nuts, sesame, soya. For more information on product labels, please contact our Customer Service department. The information on the labels of the products may vary for reasons beyond our control, therefore, there may be discrepancies between the information on the site and that on the products delivered. Please always check the information on the product before consumption or use. 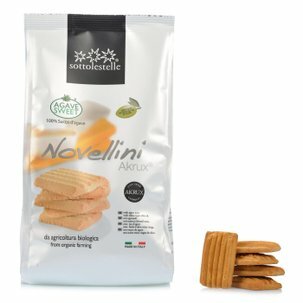 Sottolestelle is a project designed to provide natural products made without the use of artificial additives and with the utmost care in assuring the genuine nature of the ingredients. Part of the ingredients are actually sourced from the business's own farm, which produces almonds and cereals and also monitors the production chain of the olive oil employed. All the products are 100% organic and handcrafted using artisanal methods. Constant research and experimentation led to the decision to use exclusively pure organically produced essential oils in the production process. These measures also underpin theICEA certification (Italian environmental and ethical certification), awarded to Sottolestelle in recognition of the company's contributions in the sphere of environmental protection.